One of the great things about living in Monterey is its proximity to the San Francisco bay area and all of the culinary exploration opportunities that it offers. I decided to take a day trip to SF with my friend Blair yesterday to revisit some old food-favorites and embark on some new culinary adventures. I always love the drive up Highway One past those vast fields of artichokes with the morning sun reflecting off the dunes on the ocean side of the road. Though there’s always the risk of a traffic back up, I like going up to the city through Santa Cruz and up over Highway 17. It’s definitely a prettier drive than the straight shot up 101. The traffic demons did not disappoint as we encountered snarls in at least three spots which delayed the culinary indulgence that was about to ensue. Fortunately, traffic karma was kind to us when we finally reached the Mission district by providing a just big enough parking space a couple of blocks from our first destination, Tartine Bakery. I can’t say enough good things about this extraordinary bakery. The out-the-door-and-into-the-street line was efficiently moved up to the cash register by a patient and friendly staff. Blair and I shared our pork and cheese-centric breakfast treats at one of the tables out on the street. 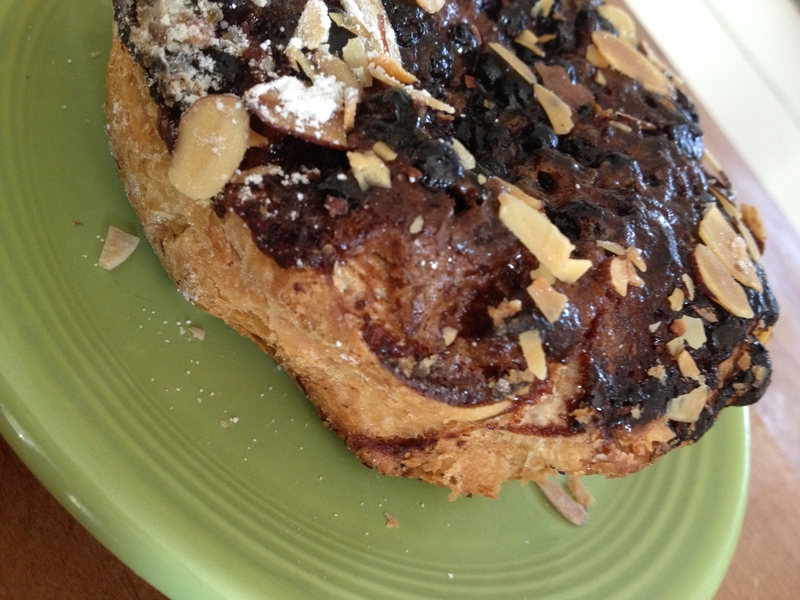 For her it was a ham, Gruyère and olive savory bread slice, and for me, the ham and cheese croissant. This croissant was absolute perfection—delicately crisp, flaky layers on the outside, giving way to a moist and tender interior. We also purchased a few treats for later consumption including a frangipane tart with huckleberries (delicious with coffee for breakfast this morning), one of their beautiful and tasty gougeres and a slice of lemon pound cake. We broke off a little piece of the pound cake before moving onto our next stop. It had this amazing dichotomy between density (it felt quite heavy in its waxed paper bag) and lightness. It felt like biting into a lemony cloud. Mouth-wateringly delicious! Everything in Tartine’s cases looked amazing, from the delicate little cookies on the top shelf to the banana cream tarts and meringue and coconut covered rectangular cakes on the bottom shelf. 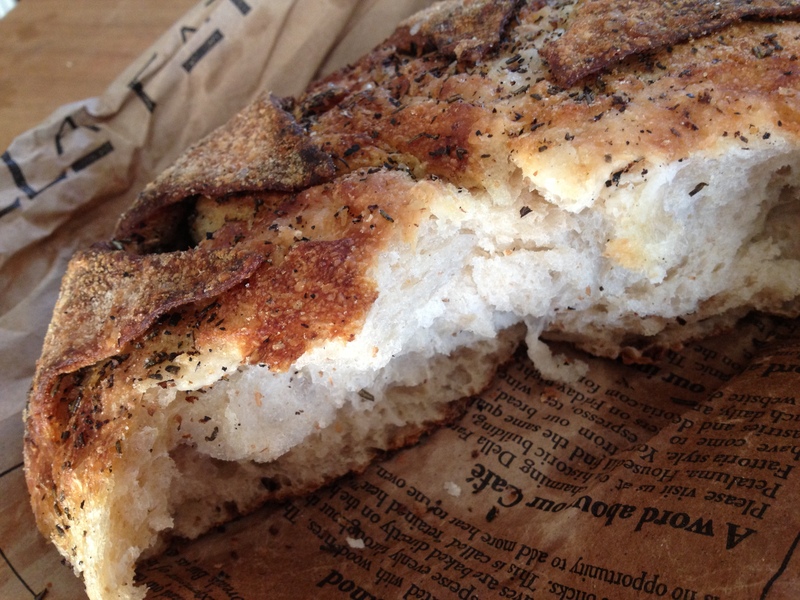 We made a quick stop at Bi Rite Market on the way back to the car to pick up a loaf of Della Frattoria Rosemary & Meyer Lemon bread…amazing! I’ll need to get over to Bi Rite’s new location on Divisidero soon. Our next destination was Berkeley Bowl West. But rather than take a straight shot over the Bay Bridge, I wanted to check out Onigilly, an onigiri place on Kearny. However, my trusty GPS seemed to have other plans. Okay, full disclosure, I may not have been giving our little dashboard companion my full attention since Blair and I were waxing rhapsodic about our Tartine experience. Happily, while trying to remember if the Tomtom said left or right in 200 yards, we drove past a newish looking izakaya place called Izakaya House in SOMA. No easy parking near Onigilly, as expected, but both of these spots are definitely on a future city trip list. A selection of onigiri – I ate one of these delicious rice balls with a crispy tempura shrimp filling in the sunny parking lot to keep the blood sugar level at an even keel while Blair enjoyed her spicy tuna onigiri. 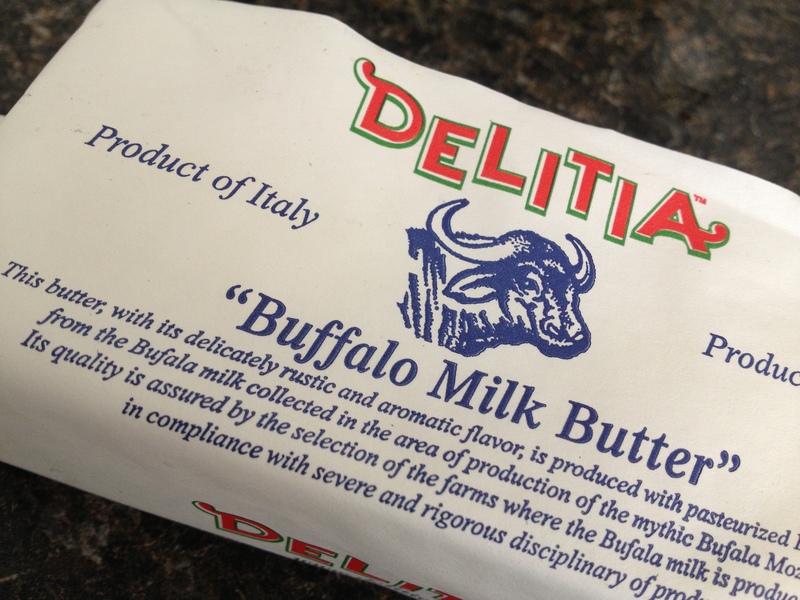 Buffalo milk butter – A rich, creamy butter with a rustic finish imported from Italy. The same company (Delitia) makes a product called Parmesan butter (also carried at BB), which I like a little better. It was, however, really good on that olive baguette with a sprinkle of coarse sea salt. Asian Snack Mix – I can’t leave BB without a bag of this salty, crunchy goodness from the bulk section. 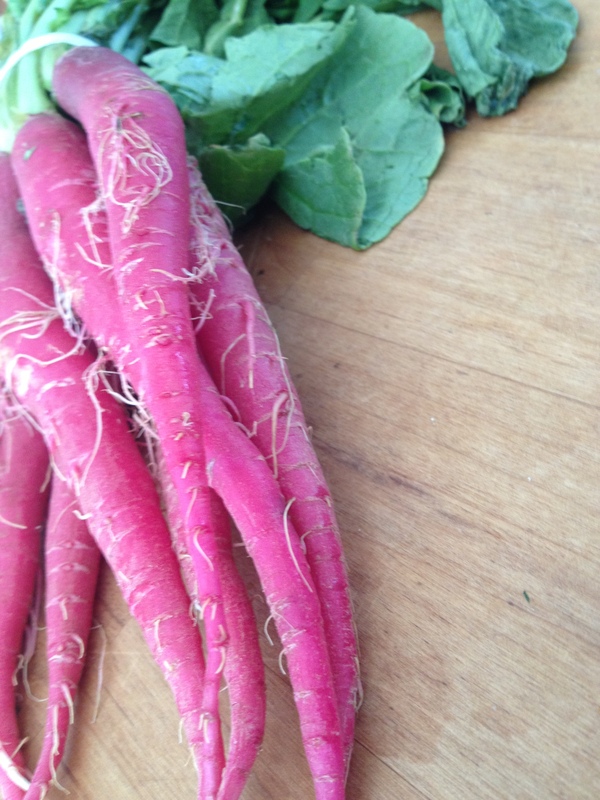 Organic Farro – Also from bulk and a bargain at $3.59/lb. 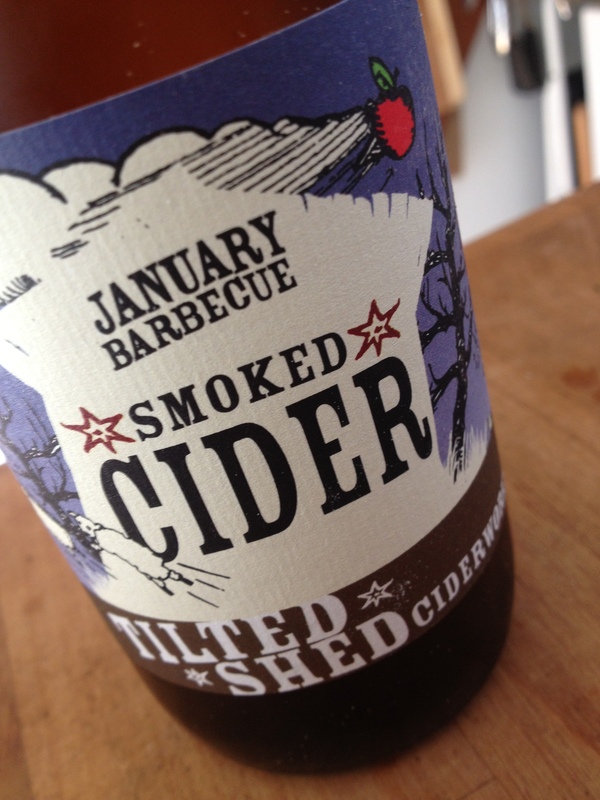 January Barbecue Smoked Cider from Tilted Shed Ciderworks – Haven’t tried it yet, but it sure sounds interesting. 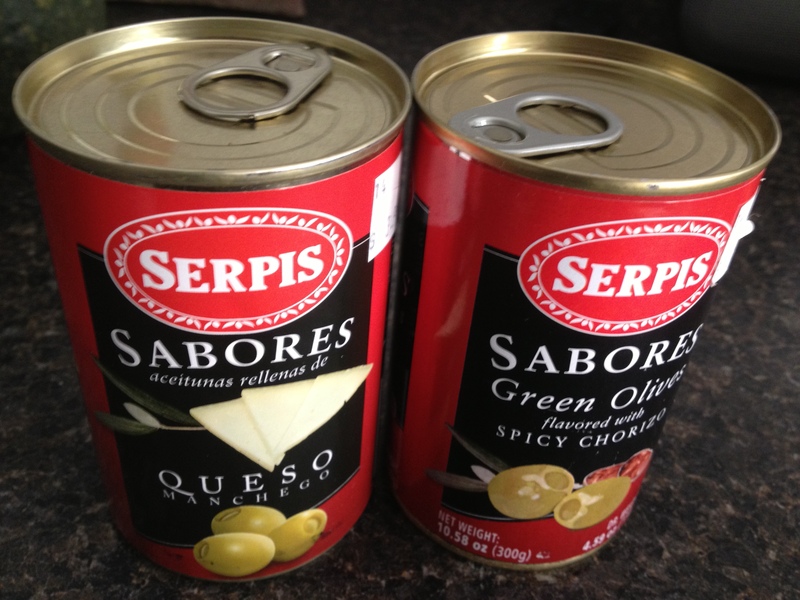 Next up was a quick trip over to The Spanish Table. I wasn’t looking for anything in particular, but always like perusing their great selection of cookbooks, salts and spices, wines, cheeses, grains and beans, cured meats, and canned and jarred goodies. Blair and I picked up a couple of cans of stuffed manzanilla olives. I’m also looking forward to trying the inexpensive bottle of red displayed at the counter. We had a hankering for dim sum when we began our trip, and normally I would head for Yank Sing in the Financial District or over to one of the dim sum shops on Irving Street in the Sunset. However, we were already on the other side of the Bay, and I thought it might be nice to explore something new. Oakland Chinatown seemed intriguing and turned out to be a great find. Covering an area of a several blocks near downtown, it’s a district jam-packed with restaurants, dim sum and pastry stores, herb shops, and housewares stores filled with inexpensive dishes, kitchen tools and gadgets. Greens of every description along with boxes filled with bitter melon, daikon, mushrooms, mandarins and heaps of other fruits and veggies spilled out of produce markets and onto the sidewalks. 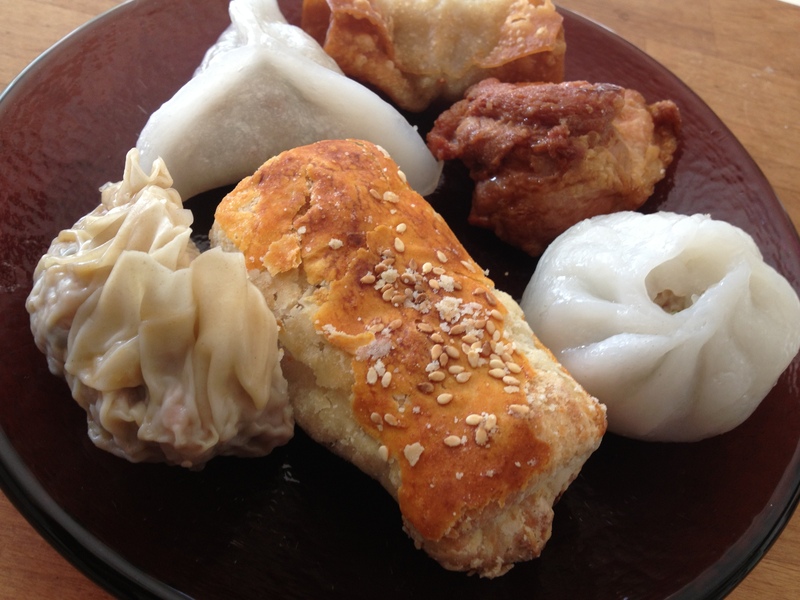 Of the multitude of dim sum pieces that we purchased for next-to-nothing , our favorites were the pork and taro dumplings from Tao Yuen Pastry on Franklin and the barbecued chicken skewers and shrimp rolls at First Cake on Webster. I also picked up some fresh noodles, marinated tofu, and preserved pork belly at Yuen Hop Noodle Company, also on Webster. As rush hour and the promise of bumper-to-bumper traffic loomed, we decided to delay the trek home and headed over to nearby Lake Merritt to enjoyed some of our goodies on a sunny bench—washed down with a little brown paper bag sake! We returned to Monterey with our shopping bags and stomachs pleasingly full. Posted on March 22, 2013, in Bay Area, Chinatown, food, Oakland, San Francisco, travel and tagged bakery, Berkeley Bowl, Bi Rite Market, bread, culinary adventure, dim sum, food, Oakland Chinatown, onigiri, Tartine Bakery. Bookmark the permalink. Leave a comment.